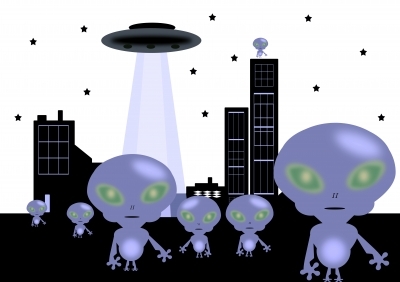 Since the early twentieth century aliens have fascinated us with the stories of UFOs and tales of abductions. Fanciful books and movies about aliens have circulated since the great hype of the 1950s. Our imaginations have run riot, and we have invented and perhaps correctly, documented many various adaptations of what alien beings may look like – some scary images and some rather pleasant ones. What if, through science fiction, these films were made to prepare us for the inevitable ‘close’ encounter? A slow and methodical, calculated adjustment to the truth that lies out there in space. After really wanting to have a tangible UFO experience, I am happy to report, my husband (Mike) and I witnessed a UFO. It was a truly awesome experience and I am ecstatic to have had him with me and to have seen exactly the same encounter. It was a reddish-orange orb (Mike said he saw a light within it) and it was flying in a straight line that eventually tapered up and out into space. It was also morphing slightly as it was flying and it made a very soft droning sound. I obviously know what an aeroplane looks and sounds like and this was not an aeroplane. The most intriguing part is that I was lying in bed with the window and curtain open. It was about 23h00 at night and Mike was lying next to me, asleep. A voice spoke inside my head and said, ‘Look out the window‘. I did and saw this orb floating past my neighbours roof. Well, I got such a fright that I literally pushed Mike out of bed and we both hurried downstairs and outside to take a closer look.